Someone call Willie Colon and KRS One and tell them I was in da Bronx twice in one week! 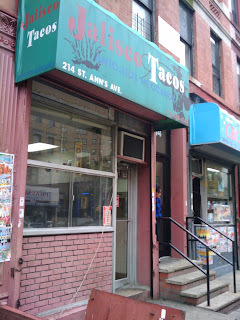 Jalisco Tacos is REALLY a whole-in-the-wall joint, with five small tables, and banda blaring, I felt right at home. I wasted no time and ordered four tacos which I forgot were going to be big tacos, so three would have been enough. Aside from tacos they serve tostadas, quesadillas, menudo, pozole, and enchiladas; you know, good old home style cooking. 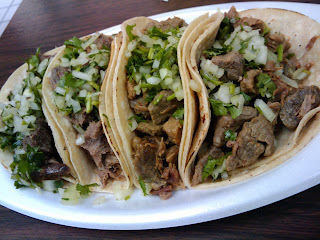 I went with carne asada (bistec) and lengua (beef tongue) tacos. I pride myself on making some good beef tongue tacos, well these guys met my standard, at one point I thought, “is my comadre back there cooking?” As for the steak tacos, they were good but I think I was in beef tongue taco bliss to even notice the steak tacos (sorry). From Manhattan take the 6 train into the Bronx to Brooks Ave, walk a block to St. Ann’s Ave and make a right.